WASHINGTON (Reuters) - U.S. consumers should be able to easily move data like photographs and contacts from one social media application to another, potentially opening up a path for new tech entrants to compete with companies like Facebook, a lawmaker set to take a lead on antitrust issues said. Representative David Cicilline, a Democrat, is in line to lead the House Judiciary Committee's antitrust subcommittee if, as expected, the Democrats win a majority of seats in the House of Representatives next month. The position would empower him to promote antitrust legislation and to draw more attention to the public debate over the power of tech companies. In an interview with Reuters last week, Cicilline said that giving consumers the power to move their data would spur the growth of new social media alternatives that could offer features such as greater privacy or less advertising. "I think our first approach ought to be this competition-based model, this portability where you say if you don't like the privacy that's provided ... in this platform, you have the ability to take your social graph (social network) and go to another platform," said Cicilline. Congress members from both parties have criticized Facebook Inc, Alphabet Inc's Google and Twitter Inc over issues including data breaches, a lack of online privacy options and accusations of political bias. The Internet Association, a group representing tech companies, last month backed the idea of allowing consumers to download personal information they had already provided to one company and easily upload it to a different one in what is known as "data portability." Cicilline also expressed concern about Amazon.com's clout as a retailer, the information it stores about customers and the large number of people it employs. "We look at the operations of Amazon today from a consumers' perspective and think, 'Oh, it's producing lower prices,'" he said. But, as it creates its own product lines and competitors fall by the wayside, its dominance has the potential to affect jobs and the make-up of main streets and malls, said Cicilline. "There are consequences to this sort of complete concentration of retail power," he said. Cicilline also said that, if the House goes Democratic, he will push for hearings to take a broad look at whether current antitrust law and enforcement is adequate, given stagnant wages and sharp price rises for some drugs and other products. 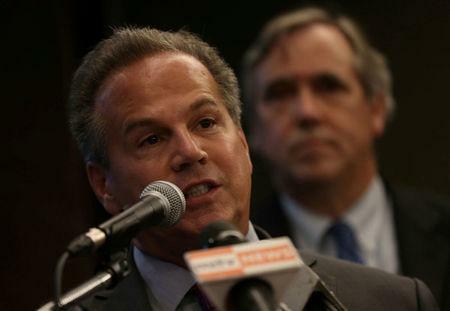 Cicilline expressed hope that could be a bipartisan effort. Newly elected lawmakers "will be coming from campaigns where they've heard a lot about people just not making enough to get by and seeing their wages remain stagnant while they witness all these huge mergers," he said.